In architecture, as in food, local is an idea whose time has come. Of course, the idea of an architecture that responds to site; draws on local building traditions, materials, and crafts; and strives to create a sense of community is not recent. Yet, the way it has evolved in the past few years in the hands of some of the world's most accomplished architects is indeed defining a new movement. From the rammed-earth houses of Rick Joy and Pacific Northwest timber houses of Tom Kundig, to the community-built structures of Rural Studio and Francis Kéré, designers everywhere are championing an architecture that exists from, in, and for a specific place. 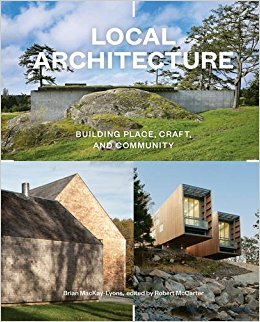 The stunning projects, presented here in the first book to examine this global shift, were featured at the thirteenth and final Ghost conference held in 2011, organized by Nova Scotia architect, educator, and local practitioner Brian MacKay-Lyons. The result is the most complete collection of contemporary regionalist architecture available, with essays by early proponents of the movement, including Kenneth Frampton, Juhani Pallasmaa, and Pritzker Prize–winning architect Glenn Murcutt. New York, 2014, 21 x 26cm, illustrated, 224pp, Hardback.